Ryan Young teaches how to throw to yourself so you have the perfect set for practicing a trick catch. By using this throw, you will put the disc into the air with the perfect nose and enough spin to keep it stable. Thus you can practice any catch and spins as well. As always, start by facing the wind. Grip the disc with a backhand grip at 3 o’clock (or 9 for counter). Now lift your arm and pivot your hand towards 6 o’clock. As your hand pivots, let the disc roll in your fingers so that it moves away from your palm. This is what generates the spin. As your hand gets to 6, release the disc into the air. The goal is to have about a 45 degree angle. The disc should float gently up and then back down and slide slightly towards you as it falls. Now you can make a trick catch. I like to call this throw a luff, in reference to a sailing ship being steered into the wind so that the sails just begin to flap. Since the goal of this throw is to be a perfect set, you want perfect wind position and only enough spin to keep the disc stable, but no more. This throw is a necessity for catch mastery and can be used as a close up speed flow pass to a friend. Ryan Young explains how to throw yourself a backhand throw with lots of spin. This is used to practice your nail delay tricks. Ryan Young explains how to throw a Frisbee with lots of spin. Why, you ask? 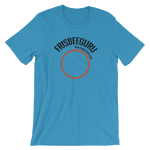 In Freestyle Frisbee, the more spin a Frisbee has, the longer you can spin it on your finger and the more tricks you can do before you have to catch it. This particular throw is the backhand throw and is one of the most common frisbee throws. It is very important to learn the fundamentals of throwing before trying more advanced moves. Remember to step towards your target, or at the very least to shift your weight from your back foot to your front foot while throwing. Concentrate on rotating your shoulders, hips and legs through to the point of release, and end with a natural follow through. Keep your arm straight for distance, or bend your elbow and exaggerate the snap of your wrist at the end of the throw for greater spin on the disc. Adjust the angle of your release for accurate throwing. The Backhand The most common throw is the Backhand release. Stand sideways toward your target, and grip the disc by placing four fingers under the rim of the disc and your thumb on top. Reach across the front of your body, then swing your arm back, releasing the disc towards your target. Tilt the outside edge of the disc down slightly (approx. 30 degrees) upon release and follow through! The Finger-Flip Stand sideways toward your target, and grip the disc by placing your thumb on top of the disc and the first two fingers in the rim. Much like snapping a towel, swing your arm along the side of your body, snapping the disc towards the target. More snap equals more spin. Tilt the outside rim down slightly upon release. Use your wrist snap to propell the disc, not your arm. The Thumber The Thumber is much like the Finger-Flip except for the grip. Stand sideways toward your target, and this time place the thumb in the rim with four fingers on top of the disc. Again, swing your arm along the side of your body, waist-high, snapping the disc toward the target. Slightly tilt the outside rim down upon release. The overhand wrist flip For this throw, stand facing your target. Begin with the same grip as the Thumber, then turn your arm and wrist over. With your wrist cocked backward, swing your arm above your shoulder and snap your wrist forward towards the target. Remember to keep the outside edge of the disc tilted slightly downward at the point of release. Trick throws can be created by modifying the throws previously described. Use momentum from spinning or pivoting to create the snap needed to throw around your back, neck or legs. Be creative and invent new throws with your friends. UPSIDEDOWN To throw the disc upside down, use the previously shown grips. Release the disc tilted slightly upward (Approx. 30o), instead of downward. CURVE To throw a Curve shot, simply angle the disc upon release of your throw in the direction of your desired curve. Special precautions should be made in windy conditions. SKIP SHOTS Skip shots can be made by striking the far edge of the disc on the ground between you and the receiver of the throw. Skip shots are easiest on hard surfaces. Catches can be made off of throws from your partner or from your own set-ups, and can be made with either hand. The disc is always spinning, so be sure to make a strong squeeze when catching. Standard catches are made with the thumb up on low catches and the thumb down on high catches. Catches can be made more difficult by spinning around before the catch is made. Below are some examples of beginning and advanced catches, but make up some of your own, that’s half the fun. Catches can be made while standing, running, sitting, lying down or jumping in the air. Nail Delay – Spinning the disc on your fingernail allows you to do many things. By balancing the spinning disc in the center, you can maneuver it under your legs, around your body and set it up for catches. Move your fingernail in a small circle underneath the spinning disc. Your finger should move in the same direction of the spin. When outside always face the wind. Note: Silicon lubricant is used to create less friction. Rim Delay – Similar to the nail delay, this technique involves letting the inside rim of the disc ride on your fingernail. Simply hook your finger so that your nail is the only thing making contact with the disc. This allows you to swoop the disc and create a flowing motion. Spin – The disc spins two ways, clockwise and counter-clockwise. When the disc is thrown with a lot of spin, the flight will be more stable, and the nail delay will last longer. Also, the disc will hold an angle longer, and be more manueverable. Percussion – Tips and kicks in the center of the disc offer many moves for the novice and professional alike. It is important to make contact as close as possible to the exact center of the disc. The action should be quick and precise for maximum control. Use your fingers, elbow, knee, head, toe or heel to pop the disc into play or to set for a catch. Experiment with trick tips under your leg, behind your back and with your feet. Air Brushing – By hitting the disc on the outside rim with either the hand or foot, you can maintain spin and keep the disc in play. It is easiest when there is a slight breeze. Angle the disc upward into the wind and brush across the outside rim. The disc will rebound. Repeat the action or make a catch. Indoors, the brushing action can be used to pass the disc to your partner. Experiment with different hits and kicks into the wind or indoors. Body rolls – Rolling the disc across your body is fun and easy. The most common roll is the chest roll. First of all, make sure to face the wind, then, while leaning your torso back and with the disc tilted towards you, start the roll at your finger tips. Step into the disc to maintain contact between your body and the disc throughout the roll, and watch the disc progress from one hand to the other. Co-op – Passing the disc between players by center delay, rim delay, air brush, kicks or tips is called co-oping. For routines on the competitive level, these tricks are choreo-graphed to music. In competitive freestyle disc play, players organize three, four and five minute routines to music, and are judged on execution, artistic impression, variety and difficulty. Tournaments are held worldwide, and exhibitions can often be seen in schools and at special events. For a simple game of throw and catch, a disc is all you need. If you desire to expand your play to the nail delay and other advanced moves you might want to spray the bottom of your disc with a dry silicone lubricant. Spraying the disc will make it slick and nearly friction-less, which allows for easier nail and rim delays. Another part of the equipment needs of professional disc athletes are fake fingernails. Since real nails tend to grind down with extensive play, fake nails are used to protect the real nail and give a secure surface for the spinning disc. Other than that, the only requirements for freestyle disc play are open space and you! The backhand throw is one of the most popular throws in Frisbee freestyle. Learn how to do freestyle Frisbee backhand throws from a world champion in this free sports video series. Expert: Todd Brodeur.